Perched among a canopy of 100-year-old trees overlooking the Sabie River in the main game-viewing region of the Kruger National Park, Lion Sands Narina Lodge offers guests breathtaking views, luxury suites and unsurpassable hospitality. 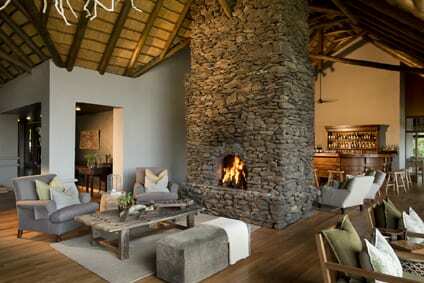 A stay at Narina Lodge will leave guests relaxed and filled with cherished memories of a true African sanctuary. The lodge consists of nine luxury suites, which are connected to the main areas via raised wooden walkways. Each suite is equipped with a private heated plunge pool and viewing deck. It’s on these decks that guests can take in the magnificent views of the Sabie River, the lifeblood of the Southern Kruger. Sharing this view is the bathroom, equipped with double basins, a large freestanding bath, a double shower, heated rails and an outdoor shower. The central area of the lodge is a beautifully decorated main lounge with a library, bar and a raised deck down by the river where guests can watch animals come to drink. A wine cellar stocked with top South African wines offers the perfect venue for wine tasting. Meals are enjoyed under the African sky and guests can expect a culinary experience prepared by the lodge’s personal chef. Treatments at the Lion Sands Africology Spa promise to soothe the senses and rejuvenate body and mind. The location of Narina Lodge is known for having the highest recorded densities of wildlife per square hectare. The reserve is untamed and untainted; as a result, guests are treated to regular sightings, often a few metres from the open Land Rover. Guides are expertly trained to not only provide you with a wealth of information on all aspects of the ecology, but are also well versed in being incredible hosts, passionate about making sure guests’ highest expectations are met. There are two game drives daily: one in the morning and the other in the late afternoon moving into the early evening when the wildlife are most active. The area is not affected by a migration of species and, as a result, game viewing is consistently good all year round. 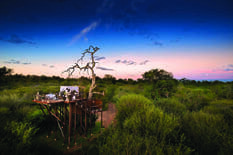 Chalkley Treehouse offers guests a unique experience, providing a closer connection to the landscape. The tree house is a secure and lavish platform under the vast African sky, with all the comforts that a guest can experience at a five-star bush lodge. Guests are taken to the tree house at sunset, where drinks and a scrumptious picnic dinner await them. The hours of African dusk can be enjoyed relaxing and absorbing the Bushveld as it transforms from day to night, before turning in for slumber. its five-star service makes it an ideal choice for an incentive travel that combines a luxurious bush experience with a distinctly African feel.